Johann "Friedrich" Gaumer born on March 12, 1750, in Macungie Township, Northampton (now Lehigh) County, PA, a twin son of Johann Dietrich and Maria "Elizabeth" (Meinert) Gaumer Sr. His middle name, which he used as his primary name, often was Americanized to "Frederick." He and his twin Johannes "John" Gaumer were baptized on Nov. 4, 1750 in Macungie. On Dec. 3, 1771, when he was 21 years of age, Friedrich married 24-year-old Catharina Barbara Eisenhardt (1747-1810), an immigrant from Deckenphronn, Baden-Wurttemberg, Germany. He was three years younger than his wife. The Gaumers produced these known children – Jacob Gaumer, Johann Dietrich "Dieter" Gaumer, Friedrich "Frederick" Gaumer, Andreas "Andrew" Gaumer, Catharina "Catherine" Gaumer and Margaretha "Margaret" Gaumer. According to Myrtle Knepper Weniger’s The Gaumer Family and Allied Lines, Friedrich was a Revolutionary War veteran. They resided in Macungie Township. Sadly, Catharina passed away in Macungie in 1810. Son Jacob Gaumer (1773-1833) was born on Nov. 21, 1773 in Macungie Township, Lehigh County, PA.
On Aug. 9, 1796, in Lehigh County, the 23-year-old Jacob was wedded to 32-year-old Catarina Keiser (1764-1840). Their five offspring were Daniel David Gaumer, Lydia Gaumer, Maria Magdalena Gaumer, Anna Maria Gaumer and George Gaumer. Sadly, little Anna Maria died in infancy in 1802. Sometime after their fifth child was born in 1802, and as late as the 1830s, they migrated to Columbia County, PA.
Jacob died in Hemlock Township, Columbia County on Feb. 8, 1833. Catarina lived for another seven years after her husband's death. She relocated to the southwestern part of the state, beyond the Allegheny Mountain range, and settled in Southampton, Somerset County. She passed away there in about 1840. Daughter Lydia Gaumer (1798-1879) was born on Oct. 17, 1798 in Macungie Township. She entered eternity in Milton, Northumberland County, PA on April 15, 1879, when she would have been 81 years of age. Daughter Maria Magdalena Gaumer (1800-1842) was born on Oct. 12, 1800 in Macungie Township. In the early 1840s, she made her home in Liberty Township, Montour County, PA. She died in Liberty at the age of 42 on Feb. 24, 1842. Son George Gaumer (1802-1873) was born on Nov. 1, 1802 in Macungie Township. He dwelled in the 1870s in Catawissa, Columbia County, PA and died there on March 24, 1873. Son Johann Dietrich "Dieter" Gaumer (1775-1830) was born on Aug. 9, 1775 in Macungie Township, Lehigh County. In about 1798, when Dieter would have been 24 years old, he was united in holy matrimony with Anna Elizabeth Heinly (1782-1850s). They produced these 11 known children -- Catharina Heinly Acker, David Gaumer, Sophia Gaumer, Samuel Gaumer, Elisabeth Gaumer, Moses D. Gaumer, Solomon Heinly Gaumer, Nathan Gaumer, William Gaumer, James Gaumer and Benjamin Gaumer, all born over the sweep of 22 years between 1799 and 1821. Heartache rocked the family at the deaths of their babies David (in 1802), Sophia (1803) and Elisabeth (1807). Johann Dietrich died in 1830 in Macungie Township at the age of 55. Anna survived as his widow for more than two decades. She relocated to the southwestern section of Pennsylvania and made her home in Somerset County, PA. She passed into eternity in the early 1850s in Somerset County. Daughter Catharina Heinly "Kate" Gaumer (1799-1858) was born on Oct. 28, 1799 in Macungie Township, Lehigh County. She was married to Henry Acker (1793-1850). They dwelled in Weisenberg, Lehigh County. Their children were Carolina Woodring, Matilda Keck, Henry Acker, Jonas Acker, Catherine Anna (Acker) Acker, Jonathan Acker and Massya ("Messiah?") Acker. Their infant son Jonathan died at about one year of age in Whitehall Township on July 20, 1834. Henry passed away in Lehigh County in 1850, at the age of 57. Kate survived him by eight years and joined him in eternity on Christmas Eve 1858 in Weisenberg. Granddaughter Carolina B. Acker (1827- ? ) was born on Dec. 28, 1827 in Pennsylvania. In about 1845, when she was age 28, she married William David Woodring (1825-1888). William was a native of Northampton County. Sadly, William died in Dayton, Montgomery County, OH at the age of 63 on Nov. 19, 1888. The cause of his death is not yet known. Carolina died sometime after 1850 but has disappeared from view. their son William Franklin Woodring (1849-1930) married Amelia E. Keller (1853-1931) and dwelled in or near Allentown, Lehigh County. Granddaughter Matilda Emma Acker (1829-1907) was born in August 1829 in Breinigsville, Weisenberg Township, Lehigh County. She married Ephraim W. Keck (1816-1863), a resident of Greenville, Mercer County, PA. They produced one known son, Ephraim Wilson Keck Jr. During the Civil War, Ephraim is believed to have served in the Union Army as a member of the 145th Pennsylvania Infantry, Company G. He enlisted on Aug. 29, 1862 and mustered out on Jan. 16, 1863. Research findings suggest that Ephraim reputedly died the same day he was discharged from the army. His remains were placed into repose in the U.S. Soldiers' and Airmen's Home National Cemetery. [Find-a-Grave] He and his fate are mentioned in the book Common Men in the War for the Common Man, by Dr. Verel R. Salmon. Matilda survived him by more than four decades, but for some reason did not apply for a military pension to compensate for the loss of her husband. She relocated to Indiana and in the early 20th century lived in Logansport, Cass County. She died there on June 9, 1907. Grandson Henry Acker Jr. (1831-1912) was born on Aug. 14, 1831 in Lower Macungie Township. He married Anna Maria Ahner (1838-1928), daughter of Solomon and Esther (Ochs) Acker. They dwelled in Lehigh County, where Henry plied his trade as a carpenter. The couple produced at least one daughter, Ellen King. Sadly, at the age of 81, suffering from paresis, a loss of voluntary muscle movement, Henry died on Sept. 13, 1912. He was interred at Lehigh Church Cemetery, with daughter Ellen of Alburtis signing the death certificate. Anna Maria lived for another 16 years, cohabitating with her daughter Ellen in Allentown at 617 North 8th Street. She passed away from the effects of a stroke two days after Christmas 1928, at the age of 90. Grandson Jonas Acker (1833-1912) was born on July 10, 1833 (or 1835) in Whitehall, Lehigh County or in Berks County, PA. At some point Jonas married, and they lived in South Lebanon Township, Lebanon County. Jonas earned a living as a laborer. He succumbed to kidney disease at the age of 79 on July 31, 1912. Interment was in Cornwall Cemetery, with F.B. Wetmer of Lebanon providing key details for the Pennsylvania certificate of death. Granddaughter Catherine Anna Acker (1833-1920) was born on Aug. 25, 1833 in Whitehall, Lehigh County. She was united in holy wedlock with a presumed cousin, Henry Acker (1839-1922), son of Benjamin and (?) (Derr) Acker. Their children were Christiana Acker, John H. Acker, Ida Acker, Emma Jane Engle, Agnes H. Acker, Benjamin Franklin Acker, Jonathan Acker and Massya ("Messiah?") Acker. Sadly, at least three of the offspring died in infancy, one in 1866 due to "summer complaint." Over the years, with Henry working as a railroader, they lived in a variety of places in Lehigh County, including West Bethlehem, Whitehall Township and Breinigsville, Weisenberg Township. Catherine died on Feb. 23, 1920. Henry lived for another two years and passed into eternity in Allentown's State Hospital on May 30, 1922, at the age of 83, caused by heart disease. His remains were lowered into the earth at Highland Cemetery. Granddaughter Massya ("Messiah?") Acker (1841- ? ) was born in about 1841 in Breinigsville, Weisenberg Township, Lehigh County. Nothing more about her is known. Breinigsville map, 1862. Courtesy Library of Congress. Son Samuel Gaumer (1803-1859) was born on Aug. 8, 1803 in Macungie Township, Lehigh County. He migrated to New York State and dwelled in the 1850s in Fayette, Seneca County. He was wedded to Permelia Gaumer ( ? -1868), a presumed cousin. Sadly, Samuel died in Fayette at the age of 56 on Sept. 8, 1859. As a widow, Permelia continued on for another 18 years. She died on Feb. 1, 1868. Son Moses D. Gaumer (1807-1871) was born on Oct. 17, 1807 in Macungie Township, Lehigh County. He is believed to have been twice married, with his second bride named Sarah Frankenfield (1816- ? ). If so, he and his first spouse produced one known son, Lewis Frank Gaumer. When the federal census was taken in 1850, the Gaumers made their home in South Whitehall Township, Lehigh County, with Moses earning a living as a shoemaker. Also residing under their roof that year were six-year-old Matilda Frankenfield and three-year-old Franklin J. Frankenfield. The copule went on to have at least four other children -- Josephine Gaumer, Henry W. Gaumer, Wiley Gaumer, Roseann Gaumer and Emma Gaumer. By 1860, Moses appears to have adopted the Frankenfield step-children and had their surnames changed to "Gaumer." During the latter half of the 1860s, following the birth of their daughter Emma, the Gaumers migrated to Illinois and settled on a farm in Eliza, Mercer County. He died in Eliza on March 9, 1871. Grandson Lewis Frank Gaumer (1844- ? ) was born in about 1844 in Lehigh County. Step-granddaughter Matilda Frankenfield Gaumer (1846- ? ) was born in about 1846. At a young age she and her brother Franklin were taken into the Gaumer home in Lower Macungie Township and raised there to adulthood. Step-grandson Franklin J. Frankenfield Gaumer (1848- ? ) was born in about 1848. At a young age he and his sister Matilda were taken into the Gaumer home in Lower Macungie Township and raised there to adulthood. Granddaughter Josephine Gaumer (1852- ? ) was born in about 1852 in Lower Macungie Township. Grandson Henry W. Gaumer (1854- ? ) was born in about 1854 in Lower Macungie Township. He migrated to Illinois with his parents and family and in 1870, at the age of 16, assisted his father on the family farm. Grandson Wiley Gaumer (1856- ? ) was born in about 1856 in Lower Macungie Township. Granddaughter Roseann Gaumer (1858- ? ) was born in about 1858 in Lower Macungie Township. Granddaughter Emma Gaumer (1865- ? ) was born in about 1865 in Lower Macungie Township. Son Solomon Heinly Gaumer (1809-1860) was born on April 4, 1809 in Macungie Township, Lehigh County. In about 1828, in Lehigh County, the 19-year-old Solomon was united in matrimony with 26-year-old Hester Maria ("Esther" or "Hettie") Rumbel Klotz (1802-1883) of Lowhill Township, Lehigh County. Her maiden name also has been spelled "Rumple." Their known children were Moses Solomon Gaumer, Jonathan Gaumer, Ann "Caroline" Ihrie, Samuel Gaumer, Sarah Ann Wiltrout, Solomon Gaumer and Benjamin Lewis Gaumer. In 1860, they made their home in Weisenberg Township, Lehigh County. Solomon died in Weisenberg on July 12, 1860. Esther lived for another 23 years. She died in Upper Macungie Township on Oct. 7, 1883. In the peaceful grave's embrace. 'Til we see thy heavenly face. Great-grandson Charles E. Gaumer (1848-1934) was born in about 1848. He was married and produced six daughters. Their home was in the Walton community near Logansport, Cass County. Circa 1895, he and others filed a legal claim against their brother in law Roberg G. Pasley "to redeem certain land in Tipton township," said the Logansport Reporter. Toward the end of his life, he dwelled in Speer, IL. Charles died in Speer at the age of 86 on Nov. 11, 1934. An obituary appeared in the Logansport Pharos-Tribune. Great-granddaughter Eliza Jane Gaumer (1851-1913) was born in about 1851. She married Robert G. Paslay (1849-1912). They bore these known offspring -- infant twins who died as babies, Rosetta M. Cannady, Eva Jane Vernon, Harry B. Paslay and Estella V. Paslay. Sadly, the babies died in 1881, son Harry in 1880 at age one and daughter Estella in 1889 at age five. At one point they owned or controlled land in Tipton Township but were sued by Eliza Jane's brother Charles and others. Robert died at the age of 62 or 63 on Sept. 28, 1912. Interment was in Deer Creek Cemetery in Onward, Cass County. Eliza joined him in death a year later on April 24, 1913. Great-grandson Jeremiah Franklin Gaumer (1860-1892) was born on March 27, 1860 in Lehigh County, PA. He migrated to Indiana and put down roots in Cass County. When he was about age 21, on Oct. 20, 1881, he was joined in holy matrimony with 21-year-old Sarah A. Snell (Jan. 2, 1860-1931), daughter of Henry Runyan and Phoebe Ann (Blinn) Snell. The couple made a residence in Walton, Cass County, IN. They were the parents of five children, born between the years 1882 and 1890 -- Charles Edward Gaumer, Clara Jane Johns, Henry Moses Gaumer, Melissa Gaumer and an infant son. The baby died in 1888. Sadly, at the age of 31, Jeremiah died on Jan. 28, 1892. The cause of his untimely demise is not yet known. Burial was in Deer Creek Cemetery in Onward, Cass County. A year after his death, a court ruled that his estate was insolvent, as reported in the Logansport (IN) Pharos-Tribune. Sarah outlived her first husband by almost four decades. She wedded again to Francis M. Zimmerman ( ? - ? ) in the 1890s. They divorced on Sept. 30, 1897. On Feb. 3, 1898, she was united in wedlock with William Bechdol (Dec. 15, 1865-1935) with the wedding taking place in Cass County. Sarah passed away on May 20, 1931. Willliam Bechdol lived for another four years and succumbed at the age of 69 in Walton, Cass County on June 30, 1935. Jeremiah's great-granddaughter, Paula Sue (Gaumer) Tooke, has gathered extensive genealogical material about this branch of the Gaumer family and graciously shared it for adaptation into this website. Great-grandson Milton Herman Gaumer (1866-1942) was born on Nov. 27, 1866 in Cass County. He married Mary Elizabeth Coil (July 5, 1858-1926), daughter of Jesse and Caroline A. (Helm) Coil. They made a home in Lawn Ridge, IL and produced these children -- Homer Joeslyn Gaumer, William Asher Gaumer and Harry James Gaumer. He is believed to have been sued by Sarah A. Zimmerman in 1896 over a dispute involving the division of land. The case was settled in July 1899 and noted in the Logansport Pharos-Tribune. Sadly, Mary Elizabeth succumbed at the age of 68, in Peoria, Peoria County, IL, on Dec. 17, 1926. He spent his final years in Peoria and died on Jan. 31, 1942 at the age of 75. Interment was beside his wife in Lawn Ridge Cemetery in Marshall County, IL. 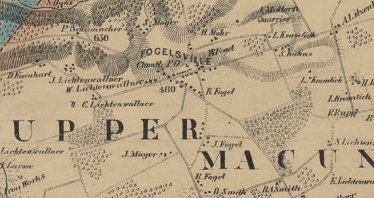 Fogelsville map, 1862. Courtesy Library of Congress. Grandson Jonathan Gaumer (1831-1889) was born on Jan. 14, 1831 in Macungie Township, Lehigh County. He married Mary Ann Hersch (1831-1915), daughter of Henry and Polly (Shide) Hersh and a native of Upper Hanover Township, Montgomery County. Their children were Emma Esther Steinberger, Luisa Elisabeth Gaumer, Ella Mary Kuhns, William H. Gaumer and Ida Rosa Minerva Meitzler. They resided in the 1850s in Philadelphia, where at least one of their children was born. In 1889, they were in Fogelsville, Lehigh County. He may be the same "Jonathan Gaumer" who in 1884 served as elder, with his brother Solomon a deacon, of St. John's Evangelical Lutheran Church of Upper Macungie Township. They are named for this work in the book History of the Counties of Lehigh and Carbon, authored by Alfred Mathews and Austin N. Hungerford (Philadelphia: Everts & Richards, 1884). Jonathan died there on Dec. 27, 1889. Mary Ann survived her husband and went to live in Cementon, Lehigh County. Stricken with cancer of her left breast, he passed away in Whitehall, Lehigh County on Sept. 20, 1915. Interment was in Fogelsville Cemetery, with William Gaumer of Cementon the informant for her death certificate. Granddaughter Caroline Gaumer (1834-1913) was born in about 1834 in Macungie Township, Lehigh County. She married Augustus Ihrie ( ? - ? ). They produced at least one known son, William Ihrie. Toward the end of her life she was a widow and made her home at 536 Front Street in Allentown. Burdened with chronic kidney and heart disease, she died at age 79 on Christmas Day 1913. W.P. Ihrie, of 607 Greenleaf Street, was the informant for the death certificate. Her remains were placed into repose in Greenwood Cemetery. Grandson Samuel Gaumer (1835-1873) was born on May 9, 1835 in Macungie Township, Lehigh County. On Feb. 27, 1859, he married Helena Heilman (1837-1916), daughter of Tobias and Elizabeth (Fries) Heilman. They produced these known sons -- Edwin Gaumer, Franklin C. Gaumer, Amos Gaumer and George Gaumer. Several of their sons are believed to have died young. Suffering from chronic kidney ailments, she died just a few weeks before her 79th birthday on Jan. 21, 1916, in Upper Macungie. Interment was in Ziegel's Church. Edwin Gaumer of Breinigsville signed the death certificate. Granddaughter Sarah Ann Gaumer (1837-1917) was born on Oct. 27, 1837 in Macungie Township, Lehigh County. On March 13, 1859, in Maxatawny, Berks County, she was joined in wedlock with William Wiltrout (1835-1900). They made their home in Macungie. They produced these known children -- Ellen A. Landis, William Alfred Wiltrout, Frank A. Wiltrout and Lilly D.S. Landis. William died at age 65 in 1900. Sarah Ann survived for 17 more years, residing with Mrs. Jacob Landis at 1950 Chew Street in Allentown. On June 25, 1917, she suffered a stroke and died. Burial was in Jordan Lutheran Cemetery. Mrs. Jacob Landis signed the death certificate. Grandson Solomon Gaumer (1842-1920) was born on May 22, 1842 in Macungie Township. When he was age 21, on Dec. 12, 1863, he married 19-year-old Anna Maria Caroline Hartman (1844-1922), daughter of Jacob and Magdaline (Raub) Hartman of Lehigh County. Among their children were Amanda Katherine Eisenhard, William Gaumer, Alice M. Held, Charles Solomon Gaumer, Laura Gaumer, Anna Schaffer, Elda Pole, Catherine Sara Miller, Jennie M. Smith and Horace Franklin Gaumer. Over the years, Solomon worked as a stationery engineer. He may be the same "Solomon Gaumer" who in 1884 served as deacon, with his brother Jonathan an elder, of St. John's Evangelical Lutheran Church of Upper Macungie Township. They are named for this work in the book History of the Counties of Lehigh and Carbon, authored by Alfred Mathews and Austin N. Hungerford (Philadelphia: Everts & Richards, 1884). In June 1917, Solomon signed an affidavit in support of his brother Benjamin's efforts to obtain a Civil War pension. Solomon died of a stroke in Foglesville, Upper Macungie on Aug. 8, 1920. Burial was in Fogelsville Cemetery. Two years later, while residing at 1126 Oak in Allentown, and suffering from diabetes, Anna Maria passed away on Sept. 16, 1922. Signing her death certificate was Mrs. Oliver Deily. Grandson Benjamin Lewis Gaumer (1844-1917) -- a.k.a. "Lewis B. Gaumer" -- was born on Nov. 22, 1844 in Upper Macungie Township. He stood 5 feet, 5¾ inches tall, with grey eyes and brown hair. On Feb. 27, 1864, at the age of 20, he married Mary Ann Layton (1845-1895), a native of Schantz's Mills, PA. Their children were Emma Amanda Esther Gaumer, Clinton L. Gaumer, Eleanor Lovina Schreiner and Annie Jane Victoria Gaumer, the youngest of whom died at the age of three. In the early 1860s, the Gaumers made their home at Fogelsville, Lehigh County. Benjamin was drafted into the Union Army during the Civil War, joining the army at Allentown on Nov. 7, 1862 and then moving to Philadelphia. Using the first name of "Lewis," he was placed into the 176th Pennsylvania Infantry, Company B. During the months of May and June 1863, he was treated for dysentery. He received his honorable discharge on Aug. 18, 1863. After the war, he earned a living as a foreman. Among his longtime friends was Tilghman H. Beisel of Allentown. On Aug. 29, 1890, he was awarded a military pension as compensation for wartime ailments. [Invalid App. #976.794 0 Cert. #846.177]. Sadly, Mary Ann passed away in Allentown on Oct. 25, 1895. Benjamin married for a second time, to Elizabeth Shaffer (Aug. 17, 1854-1925), daughter of Lavinous and Julia (Barker) Shaffer. The nuptials were celebrated in Williamsport, Lycomign County, PA by the hand of Rev. Marion L. Firor of St. John's Reformed Church. Benjamin was age 52 at the time and Elizabeth 42. Elizabeth had been married and divorced from Edward Behringer (or "Baringer"), with the divorce decree made in 1890 in Williamsport. In his last years, Benjamin lived at 206 North Second Street in Allentown. His physician F.B. Schiner treated him for chronic rheumatism, heart disease, nervous prostration, kidney trouble, failing eyesight and congestion of the livery. Burdened with diabetes and a case of bronchitis, he received additional medical care from W.J. Hertz, M.D. Benjamin died on June 1, 1917. Burial was in West End Cemetery. His brother Solomon attended the funeral and burial. As a widow, Elizabeth began receiving her husband's monthly pension payments. [Widow App. #1.103.776 - Cert. #846.305]. Her home address circa June 1917 was 206 North Second Street in Allentown. She became senile and died of heart issues at age 74 on Dec. 3, 1925. Her remains were buried in West End Cemetery. Son Nathan Gaumer (1813-1896) was born on June 26, 1813 in Macungie Township, Lehigh County. On Dec. 8, 1836, at the age of 23, he married 18-year-old Mary Ann Keck (March 1, 1818-1887) of Salisbury, PA, also known as "Lehigh Mountain." The couple bore four known offspring, Allen Andrew Gaumer, Willoughby Gaumer, Ellen Hendrickson Brogan and Matilda E. Lucas. They kept a family Bible in which they inscribed family births. Nathan was a master carpenter and building contractor for many years, assisted by his sons up until the Civil War. In about 1837, a year after their marriage, the couple established a home in Allentown, Lehigh County and remained there for half a century. The federal census of 1850 shows the Gaumers in East Allentown and in 1860 living in Allentown. In 1861, Nathan was named in a Philadelphia Inquirer notice about the marriage of their daughter Ellen to Paul Henrickson of Germantown. After the Civil War broke out, their sons Allen and Willoughby enlisted in the army during the war and sent funds home to support their parents. Tragically, the sons both sacrificed their lives. Remaining at home during the war, Nathan is known to have broken his right leg at the ankle joint in April or May 1862. The injury rendered him unable to perform his carpentry work for the months of April through July. He also sustained a hernia during that time and contracted typhoid fever. He frequently purchased medicines and linaments from local pharmacist Lewis F. Schmidt, always paying cash. In August, back on his feet, he was able to work for 12½ days at a wage of $1.50 per day. Then in September he labored for 24 days, again earning $1.50 as a daily wage. With crops harvested, and the nation at war, there was no work to do in the months of October, November or December 1862. Income was so scarce that Mary Ann occasionally went to the office of Abraham Keck, asking to borrow money, and at times he gave her $10 and $20 and once $80. With both of his sons dead, but with the promise of regular pay, Nathan at age 51 decided that to take up their fallen legacy. He joined the Union Army on Aug. 25, 1864 and was assigned to the 202nd Pennsylvania Infantry, Company E. In all, with a bad leg and limp, he served for 12 months. Capt. Benjamin C. Roth, who commanded Company E, Once said that "Nathan Gaumer was not an able bodied soldier during his service... He would never have passed muster had he not been rushed through, because he was physically not able to serve as a soldier, and during the greater period of his service did he only do fatigue duty, such as cook help, carrier of water, +c. He was thus detailed for such duty because of physical disability, was not able to march, and was not fit for regular military service." Nathan received an honorable discharge at Harrisburg, PA on Aug. 3, 1865. After the war, he was an active Republican and served on the Allentown school board (First Ward) and city council. Over the years, any letters which their sons sent home from the army were lost or destroyed. Some two decades following the war, on July 18, 1884, Mary Ann filed for a special mother's pension for both sons, and both requests were denied. [Mother's App. #317.822]. The Gaumers are believed to have lived in Philadelphia circa 1886 at the address of 2602 North 11th Street. Sadly, Mary Ann succumbed at the age of 69 on Aug. 10, 1887. She rests for all time in Union-West End Cemetery. Nathan survived her by nine years and made his home at 117 North Third Street in Allentown.On Aug. 17, 1887, a week after his wife's death, he was awarded a pension in the case of his dead son Allen. [Father's App. #359.424 - Cert. #248.667] From then until his death, Nathan received $12 each month. In August 1888, friend Edward H. Lucas of Philadelphia noted that Nathan "is old and feeble now, can do nothing whatever. At times his mind is affected because of age." He died at home on Aug. 11, 1896, at the age of 83. Burial was in Union-West End Cemetery. [Find-a-Grave] In an obituary, the Allentown Democrat reported that he "had been in ill health the past six weeks, but was not bedfast. Death was caused by weakness incident to his advanced age." The article also named Nathan's surviving grandchildren -- Mrs. E.H. Lucas of Philadelphia, Mrs. William Harriman of Chicago, Arthur Lucas of Philadelphia and Charles Hendrickson of Allentown. Grandson Allan Andrew Gaumer (1838-1862) was born on July 26, 1838 and grew up in Allentown. He never married nor reproduced. When the Civil War broke out, he joined the Union Army in Harrisburg, PA on Aug. 30, 1861 for a term of three years. He was assigned to the 47th Pennsylvania Infantry, Company B and attained the rank of first sergeant. In January and February 1862, Allen became sick and was confined to his quarters. He may have seen service in Key West, FL. The regiment moved to Pocotaligo, SC, in an effort to disrupt the operations of the Charleston and Savannah Railroad. In this action, involving 4,500 Union and 2,000 Confederate troops, Allan was shot and killed. Named Pocotaligo for a small tidal creek between Beauford and Jasper Counties, the battle took place on the Frampton Plantation. His burial site is not known. Family erroneously thought that his death took place in Key West, and this was reported in the father's Allentown Morning Call obituary in 1896. Grandson Willoughby Gaumer (1841-1861) was born in about 1841 and grew up in Allentown, Lehigh County. He never married nor produced children. Just a few days after the Confederate attack on Fort Sumter, which plunged the nation into the Civil War, Willough joined the Union Army on April 20, 1861. He was placed within the ranks of the 1st Pennsylvania Infantry, Company I, commanded by W.H. Gansler. While in camp in Allentown, just four months into his soldier's life, he contracted "camp fever." His health declined rapidly. He completed his three month term of service, and received an honorable discharge on July 26, 1861, but his health was beyond repair. Just a few weeks later, he succumbed on Aug. 7, 1861. Said the Allentown Democrat in 1896, "He was the first soldier to die here." His remains were placed into repose in Union-West End Cemetery in Allentown, and a standard-issue military marker was erected at the grave. [Find-a-Grave] His grieving mother filed for a military pension as compensation for her loss, but it was not approved. Grandaughter Ellen J. Gaumer (1843- ? ) was born in July 1843. At the age of 17, in 1860, she was employed as a shoe binder in Allentown. On Oct. 20, 1861, she was joined in wedlock with Paul Hendrickson (1839-1890? ), a resident of Germantown near Philadelphia, and an immigrant from Baden, Germany. Rev. Samuel Beck officiated, with the news published in the Philadelphia Inquirer. The couple produced at least three children, Charles Henrichsen, Edmund Hendrickson and Mary "Mamie" Heimbach Harriman. Census records for 1870 show the family in Allentown, with Paul earning a living as a liveryman. Then in 1880, with Paul working as an "agent," they lived in a boarding house in Philadelphia kept by Ellen's married sister and brother in law, Matilda and Edward Lucas. Sadly, Paul died in about 1890. Ellen survived him by 14 years. She married again to Charles Brogan ( ? - ? ) of Philadelphia, who died in or before 1896. Now twice widowed, Ellen relocated to Chicago to dwell with her married daughter on West Monroe Street. Ellen died at the age of 59, on April 4, 1904, in her daughter's Chicago home. The remains were shipped to Pennsylvania to rest for all time in Union-West End Cemetery in Allentown. Graveside services were led by Rev. C.H. Bohner. An obituary in the Allentown Morning Call said she had succumbed to "a lingering illness" and that her parents had been "old and respected residents of the First Ward." Great-grandson Charles Henrichsen (1867-1930) -- originally Hendrickson and also Henricksen -- was born on Feb. 12, 1867 in Allentown. Other less-reliable sources give his birthdate as Feb. 12, 1875. He lived in Allentown for his entire life and earned a living as a silk weaver and twister. The Allentown Morning Call once said that Charles "in his younger days figured prominently as a local boxer." His address in 1904 was 222 North 16th Street, and that year, the funeral of his mother was held in his home. Charles was twice married. In about 1891, he wedded his first bride, Louisa L. Smith (Aug. 21, 1872-1917), daughter of Samuel and Carolina (Klein) Smith. They did not reproduce. When the federal census enumeration was made in 1900, they lived in Allentown and provided a home for Louisa's widowed brother Edward Smith and his two young children. As her mental health failed, and she was diagnosed wth "general paralysis of the insane," she was admitted to the Homeopathic State Hospital in Hanover Township, Lehigh County. Sadly, she passed away at the age of 44 on April 23, 1917. Interment was in Hillside Cemetery in Whitehall near Allentown. Charles' home in the early 1920s was at 612 Park Street. After five years of grieving, in 1922, he wedded a second time to Catherine Byrne (Sept. 8, 1881-1928), a native of Bethlehem, Northampton County and the daughter of Patrick F. and Mary (Martin) Byrne. Alderman William F. Bower officiated. In commenting on the wedding, the Morning Call remarked that "This is his second venture in the matrimonial field, his first wife having died." She worked as a ribbon weaver, and they may have known each other from the workplace. The couple made a home at the corner of Meadow and Summer Avenue. Their marriage endured for six years until her death in Allentown on July 25, 1928, at age 46, due to what a physician called "alcoholic collapse." Her remains were placed into repose in Holy Sepulchre Cemetery. For the final two or more years of his life, Charles suffered from hardening of the arteries. At the age of 55, on Oct. 5, 1930, he passed away in the State Hospital in Allentown. Burial was in Hillside Cemetery, today known as the Garden of Peace Cemetery. Great-grandson Edmund Hendrickson (1870- ? ) was born in Feb. 1870. Great-granddaughter Mary "Mamie" Hendrickson (1872- ? ) was born in Feb. 1872. She grew up in Philadelphia. At the age of 16, on June 21, 1888, she wedded her first spouse, 23-year-old upholsterer Frank H. Heimbach (1865- ? ), son of George Himbach. Because she was legally underage, Mamie's mother had to sign her consent to the union. Rev. A. Krecker officiated. The marriage apparently did not last. Then in about 1896, when she would have been the age of 23 or 24, Mamie was joined in matrimony with William M. "Will" Harriman (May 1860- ? ), a native of Maine. The couple did not reproduce. They relocated to Chicago, where Will managed a leather business for decades. Their home in 1900-1910 was on West Monroe Street. Their fates after that are not known. Granddaughter Matilda E. Gaumer (1847-1896?) was born in about 1847. She grew up in Allentown, Lehigh County. On May 24, 1863, she married Edward H. Lucas (July 1839-1900). Rev. Richard Walter officiated, with the news published in the German language newspaper Der Lecha Caunty Patriot. Bride and husband were eight years apart in age. The couple were the parents of one known son, Arthur Lucas, born in 1868. Their home in 1870 was in Philadelphia, where Edward earned income as a store clerk. In 1880, still in Philadelphia, with Edward's occupation listed by a census-taker as "salesman," their address was on North Fourth Street. They kept a boarding house, and in 1880 their guests included Matilda's married sister Ellen and family. "For some time," said the Allentown Morning Call, "he had charge of a shoe factory at Milford. While a resident of Allentown he was a traveling salesman for a Philadelphia shoe house." Circa January 1885, when she signed an affidavit in support of her mother's Civil War pension application, she resided in Allentown. Sadly, Matilda is believed to have died in Philadelphia in about 1896. Edward relocated in about 1893 to Milford, Hunterdon County, NJ and spent the remaining seven years of his life there. In June 1900, federal census records show him without an occupation and boarding in the household of John C. and Lillie Stein in Holland, Hunterdon County. On the fateful evening of Nov. 2, 1900, while "in apparently good health," said the Morning Call, he went to bed and never awoke. He was found dead the next morning. In addition to his son, he was survived by brotherw Walte and Benjamin Lucas of Allentown, James Lucas of Washington, DC, Rebecca Orwig of Orwigsburg and Sarah Cassel of South Allentown. Great-grandson Arthur Lucas (1868- ? ) was born in 1868 in Allentown. He lived in Philadelphia in 1896. Son William Gaumer (1816-1851) was born in 1816 in Macungie Township, Lehigh County. Sadly, he only lived to the age of 36, dying in 1851 of yet-unknown causes. More will be added here when learned. Son James Gaumer (1819-1874) was born on July 5, 1819 in Macungie Township, Lehigh County. He migrated to Iowa, planting roots in Iowa City, Wright County. He died in Iowa City on April 15, 1874 at the age of 55. In recent years, researcher Nancy Brown had information about James from a family Bible. Son Benjamin Gaumer (1821-1874) was born on Nov. 21, 1821 in Macungie Township, Lehigh County. As did his older brother James, Benjamin was a pioneer of Iowa. He succumbed in Iowa on April 15, 1874. Son Friedrich "Frederick" Gaumer (1778-1811) was born on Feb. 1, 1778 in Macungie Township, Lehigh County. Friedrich was united in holy matrimony with Hannah Barber (1790-1857). There was a 12-year difference in their ages. The Gaumers produced five children -- Charles B. Gaumer, Hannah Gaumer, Susanna Gaumer, Samuel Gaumer and Elias Gaumer. Sadly, the middle three children died in infancy, all between the years 1804 and 1807. Jacob passed away in 1811, at the age of 33, leaving behind his wife and two young sons. Son Charles B. Gaumer (1802-1871) was born on April 6, 1802 in Macungie Township, Lehigh County. All that is known is that he succumbed on March 1, 1871 in Macungie. Son Elias Gaumer (1810-1842) was born on Oct. 2, 1810 in Macungie Township, Lehigh County. Some records suggest that he married Salome Hannah Desch ( ? - ? ). Other evidence hints that he wedded Sophia Christman ( ? -1908), daughter of Macungie hotel keepers George and Sarah Christman. But there are many discrepancies in the record, and this all needs to be researched and affirmed. Elias reputedly died at the age of 32 on July 15, 1842 in Macungie. His remains were placed into repose in the Solomons United Church of Christ Cemetery in Macungie. [Find-a-Grave] If his wife in fact was Sophia Christman, they had two children, Mrs. Charles G. Wentzel and Maria Desch, the latter of whom married Rev. Henry Desch and died in Allentown on Jan. 25, 1909.. Son Andreas "Andrew" Gaumer (1781-1790) was born on June 24, 1781 in Macungie Township, Lehigh County. He did not survive childhood. At the age of nine, Andreas died in Macungie in 1790. More about his short life will be added here when discovered. Daughter Catherina "Catherine" Gaumer (1783-1846) was born on June 19, 1783 in Macungie Township, Lehigh County, PA and may have been named for a younger sister born seven years earlier and apparently died in childhood. Catharina died on Sept. 15, 1846 in Longswamp Township, Berks County, PA. Daughter Margaretha "Margaret" Gaumer (1786-1844) was born on Dec. 3, 1786 in Macungie Township, Lehigh County. She passed into eternity at the age of 57 on March 12, 1844 in Macungie. Son Johannes Gaumer (1799- ? ) was born on Dec. 16, 1799 in Lehigh County, PA. Nothing more about his life is known. Many thanks to Paula (Gaumer) Tooke for so graciously sharing her research discoveries for this biography.